In a column my father wrote on the eve of the new year in 1934, he recalls seeing the Statue of Liberty for the first time 11 years earlier. He arrived on Ellis Island aboard the SS Fort Victoria on Nov. 1, 1923 at age 26, 48 hours after leaving Bermuda, where he worked as a printer for six months. His entry seemed relatively easy. From the sound of it, he passed the physical and intelligence tests and the interrogations immigrants were put through fairly handily and headed straight for Harlem. The biggest tests were yet to come: As he put it, he had to learn to be racial, to understand Jim Crow, both the southern and northern varieties. He had to weather the Great Depression and witness America’s promise and its shortcomings. 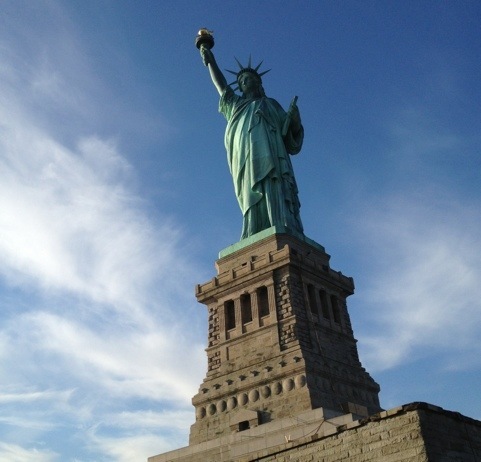 Although I lived in New York for several years in the 80s and still often see the city as a second home, it was not until this week that I set out like a tourist and visited the Ellis Island Museum and Liberty Island, where I finally saw the Lady up close. It was probably divine intervention that kept me from there until now. It has so much more resonance. Happy New Year, dear readers. Thanks for taking this journey with me.